Operations and Maintenance of PV Parks requires continuous yield monitoring. Even short interruptions can cause losses of thousands of Pounds (or Euros), depending on the size of the installation. 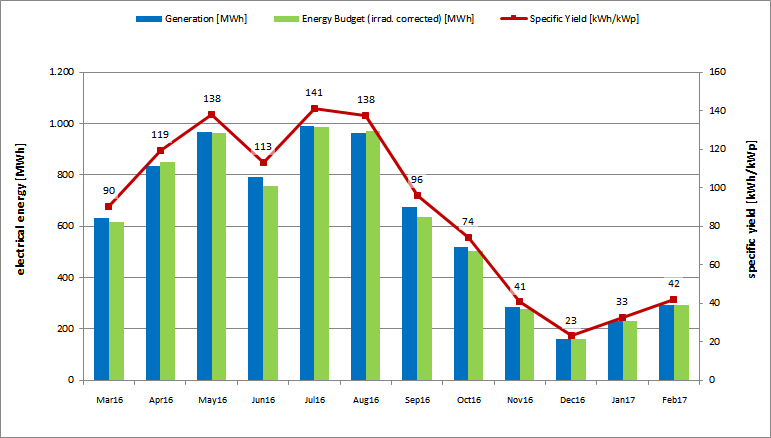 When a 20 MW PV park is inoperative for a day, 100 MWh of energy can easily be lost, an amount the investor will not have budgeted for. The time for repairs and maintenance for utility-size solar parks has to be chosen in a way that only few sun-hours are lost and the installation stays mostly productive. All operations and maintenance companies therefore streamline their processed to avoid and reduce downtime - especially for large-scale PV parks. Asset Managers - frequently experts from the world of finance, frequently perform a monitoring role in order to assure financial returns for investors. However, since not every Asset Manager has an overview over the technical particularities of photovoltaics, unambiguous performance indicators are needed to assess the effectivity and added-value of the operations and maintenance team. Earlier the performance of a PV park was often measured by the performance ratio alone. Today, however a multitude of key performance indicators is used to optimize large-scale power plants. Availability is one of the top indicators employed because it is a parameter - independent of weather data (which cannot be influenced) representing the quality of operations as well as the duration for problem solving. Well-maintained power-plants have fewer outages; well planned maintenance reduces downtimes and yield losses and quick reaction times of the operations team in case of failure will help to keep technical availability close to 100%. Naturally, not all outages are attributable to failures in operation - think of blackouts, power reductions or planned downtime. This is why, besides the technical availability, being the responsibility of the operations team, external availability is established in today's yield reports. The concise representation of results in graphs, which are easily and intuitively understood by anybody, is an important feature of monthly performance reports. Non-technicians too, have to be able to comprehend yield reports with ease. The display of historic data, graphs with planned targets, as well as the detailed report of deviations in energy produced or in the availability of the plant are helpful. The data-flow of PV monitoring data is becoming a multi-step process. Inverter, string and weather data are often collected, stored and forwarded by the data-logger of the inverter manufacturer. This data usually can be visualized via the internet portal of the inverter manufacturer. With more and more PV plants the data collection takes place via hardware of monitoring providers such as Skytron, Meteocontrol or GPM. This is especially useful when an investor owns multiple PV parks with inverters from different manufacturers. The data-logger of monitoring providers forward the data to their databases from where the operator (and also the investor) can visualize, download and analyze the results via an internet portal or a specific operating-software. However, only a few Asset Managers are happy with the parameters provided by the monitoring-providers alone, because these are not always customizable. The comparison of historic or budget data should be possible as well as the calculation of individual key performance indicators in daily or monthly resolution. Depending on the Asset Manager non-numeric data is required in the report as well (e.g. the report of outages and incidents, pictures taken of maintenance jobs or the serial numbers of replace components. In this case, the reports are usually finished with the help of desktop publishing, or spread-sheet software, allowing the integration of data, text and images. Professional plant monitoring and the publishing of Yield Reports for Investors therefore is a task still not fully automated. It requires a deep understanding of PV performance indicators as well as the skills to illustrate this content in a simple and unambiguous manner.